Ideally situated to enjoy St Ives and the magnificent West Cornwall coastline, The Atlantic Hotel is one of the premier Hotels in St Ives. They provide clean, comfortable, quality accommodation the Atlantic Hotel is able to meet your requirements whether it be for a short break or a full family holiday. Its stylish Waves Restaurant offers a contemporary British style menu but with a distinct Mediterranean influence. The restaurant and relaxing lounge bar will help ease you into the holiday frame of mind with contemporary tastes and a relaxing atmosphere. 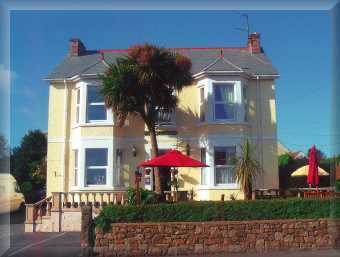 Beechwood Hotel lies in an area of outstanding natural beauty, looking out over St Ives Bay. The Hotel is in the ideal location to explore St Ives and West Cornwall. Carbis Bay beach is within walking distance of the Hotel and the nearby coast path provides a beautiful walk along the cliffs and sand dunes. Most of our rooms have en-suite facilities. All rooms have colour televisions and tea and coffee making facilities, some have sea views. There is also a private car park. The Borthalan Hotel is a small friendly privately owned hotel personally managed by the proprietors, Martin and Margaret Smith. The Borthalan Hotel is a house with a great deal of character. The Boskerris is a contemporary, boutique hotel with a relaxed Mediterranean style. The hotel has fifteen elegant and stylish bedrooms, most with outstanding panoramic ocean views. The hotel is nestled in the Cornish coastline, on the edge of St Ives. Discreetly set in one and a half acres in a unique position, with the decked terrace being the perfect vantage point to admire the views across St Ives Bay from Godrevy Lighthouse to St Ives harbour. Just below is stunning Carbis Bay beach, perfect to unwind on. Pick up the coastal path for a beautiful walk into St Ives or take the three minute trip into town on the train. St. Merryn Hotel, St. Ives is a comfortable family run Hotel with its own spacious grounds and gardens on the main St. Ives road. The Hotel occupies an ideal position overlooking St Ives Bay. It is tastefully furnished and has full central heating throughout. There is a 9-hole putting green in the gardens at the front of the hotel, whilst at the rear it has its own private car park with easy access and ample space for everyone. In the heart of a beautiful sandy bay, the stunning Carbis Bay Hotel occupies a dramatic waterfront location with direct access to its own Blue Flag accredited beach. Nestled above 25 acres of golden sands with spectacular sea views and steeped in over 100 years of tradition and history, it is hard to imagine a more splendid setting than Carbis Bay which has been recognised internationally as one of the most beautiful bays of the world. Whatever your mood, the Carbis Bay Hotel combines the perfect holiday ingredients. Enjoy the comfort of its 44 individually furnished rooms and the luxury of room service; relax in one of the spacious lounges or sip a cocktail in the magnificent conservatory.